Quick Savings » Which is the best free financial health check tool? Which is the best free financial health check tool? What is a financial health check tool? When it comes to money it is hard to know how you are doing financially and whether you are comfortably set up for everything that life throws at you. Where do you start when it comes to making sense of your finances and what order should you tackle things? If you bank with one of the main high street banks then you may be offered a 'free financial health check' with one of their financial advisers, but it will often require a time consuming face-to-face meeting with the end result likely to be heavily focussed on selling you additional products offered by the bank. You can however complete a free financial health check from the comfort of your own home and not only is it more convenient to do so, the results can be provided in order of priority, rather than what will earn someone the most commission. 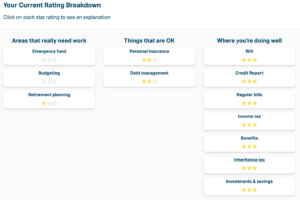 That being said, there are relatively few financial health check tools around, and so we have reviewed the best we could find and also reveal which is the best free financial health check tool. 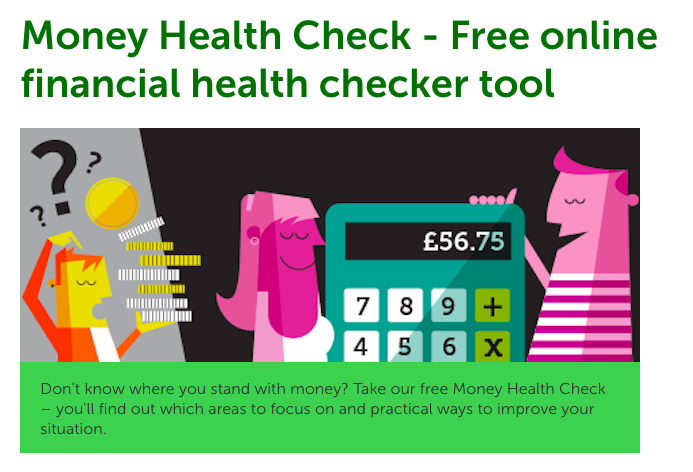 The Money Health check from the Money Advice Service offers tailor made advice plans and step-by-step guides on how to help get your finances in check. It asks you a range of questions to help gauge how your finances shape up and then offers its advice plan based on the result. You do not have to sign up and it is fairly quick and simple to complete. The sad red face above is the score I got for completing the free online financial health checker tool with The Money Advice Service, however I don't feel that it is a very fair or accurate representation of my circumstances. For example, I was marked down for not having a will despite not being married, not owning a home or having any children or dependents which should therefore determine that I don't actually need a will. The financial health check tool itself isn't very specific with the questions it asks you and they are not relevant to everyone who may use the tool. I feel they make assumptions on personal circumstances rather than giving accurate answers. 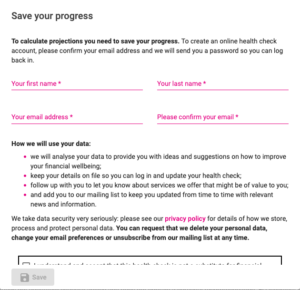 The financial health check tool does offer me 9 plans which are supposedly tailored to me. The 'emergency fund' plan could be helpful however the 'Starting a will' plan is not. 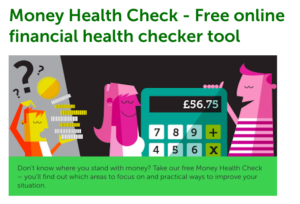 The Money Advice Service financial health check tool is a good tool that helps you get an idea of some of the things you should be considering when it comes to managing your finances however, it could be further improved by actually being relevant to personal circumstances. 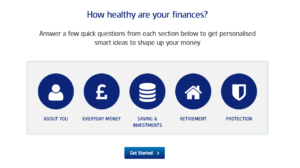 Standard Life offer a free financial health check tool that claims to give you 'personalised smart ideas to shape up your money' if you answer a short series of questions. 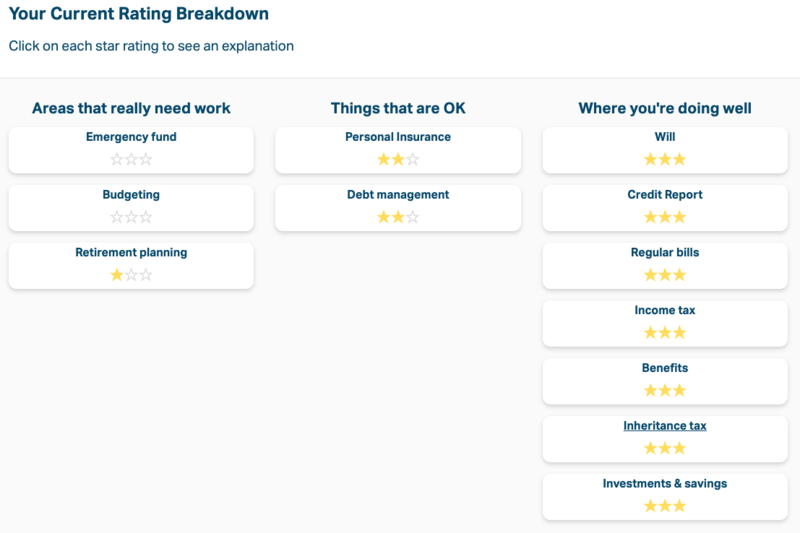 To begin with, the financial health check tool asks for your name and age, but this is then followed by diving straight into the deep end, asking if you hold any savings or investment accounts. It then wants to know what your rough annual income is and how you rate your finances out of 5 stars, 1 being poor and 5 being great. I think my finances are pretty average, so I rank myself with 3 out of 5 stars. The questions are broken down into 4 categories following the 'about you' section, 'Everyday Money, Saving & Investment, Retirement and Protection.' 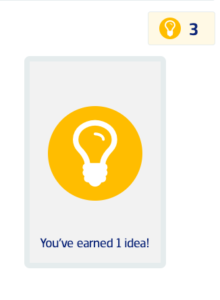 As you complete each section you earn ideas for your report at the end. As I have no savings or investments, that section is skipped out for me and the next questions ask me about retirement and whether I pay into a pension. Finally, I am asked if I have a will or if I would be ok should I be out of work for a long period of time. My Standard Life financial health check report rates me with 2/5 stars, compared to my predicted 3/5 stars. The tips I have accumulated throughout the tool are listed for me to read. The tool recommends I cut back paying interest on my credit card, which I do not actually do as I have a 0% interest purchase card and often transfer any balances to another 0% card if I need to. It also recommends that I create a will, which, as revealed in the review of the money health check tool from the money advice service, I don't feel I need and leaves me to question how personalised it really is. 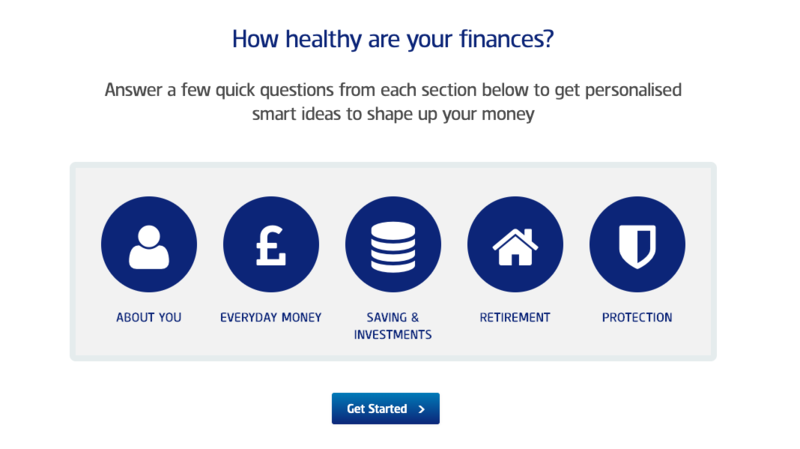 EQ Investors are chartered financial planners and have created a free financial health check tool designed to measure your 'financial fitness'. There are 6 stages to the financial health check tool, 'About me', 'Life plan', 'My finances', 'Cash flow', 'Net worth' and 'Fitness summary'. The life plan highlights what your anticipated life expectancy is based on your current age, which highlights the importance of planning for the future after retirement. 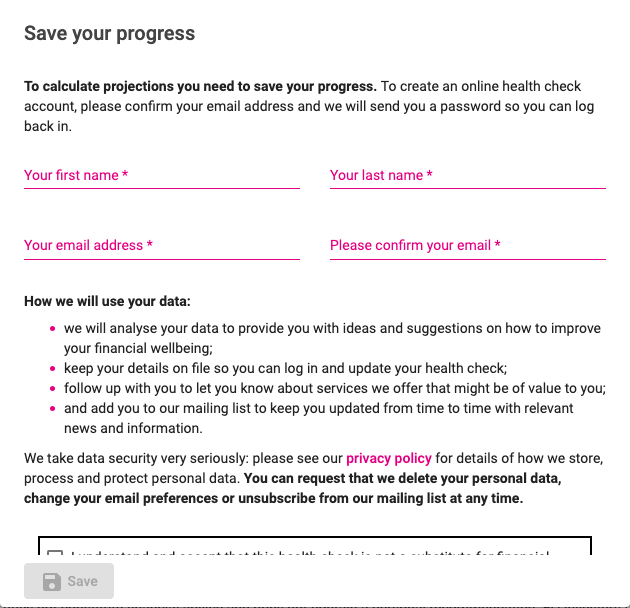 I can only make it as far as 'My finances' before the financial health check tool requires you to sign up before you can go any further. I tried to sign up to the tool however I could not actually get past the sign up page even after registering. Therefore, I did not complete the tool and don't know how my finances shape up in comparison to the other financial health check tools mentioned previously. While it is good to see that businesses are taking personal finance seriously and taking it upon themselves to develop free tools, there is clearly some work still to do. That is why we at Money to the Masses have developed our own free financial health check tool (Damien's Money MOT), which in just a few minutes will give you a personalised breakdown of how your finances shape up. By answering just a few simple, anonymous questions, you will receive a bespoke assessment of your finances, receiving a Money MOT grade (from A to E). You will be provided a detailed breakdown of the areas of your finances that may need attention (without having to register or provide any paperwork) You'll also be able to see how you compare to the thousands of others that have completed the health check. Check out our full review below. Damien, founder of moneytothemasses.com, created Damien's Money MOT with the aim of helping people make sense of their financial situation and give them the knowledge and resources to try and do something about it. When coming up with the concept, Damien said "I wanted everyone, irrespective of age or wealth to be given free access to information and tools that can help them take control of their financial decisions". How could we help everyone in an ad break on their phone, after all that's where their attention is? In that time how could we give people an accurate and bespoke assessment of their finances, anonymously and benchmark them against their peers? How could we then help them take concrete steps to improve their finances (i.e start the journey of improvement)? 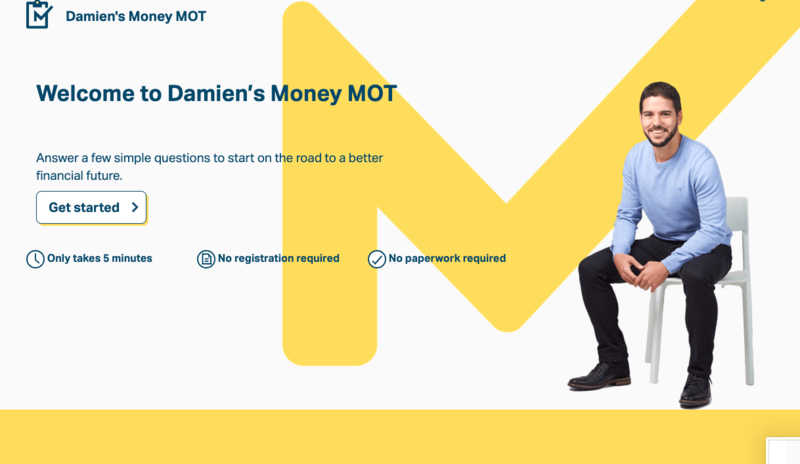 The tool starts by asking you some personal questions about age, employment and living situation; this is so that Damien's Money MOT can personally tailor the results to you. It also ensures that information that is irrelevant to your financial situation is stripped out. Once you have answered a short series of questions (grouped into 12 categories) you will receive a star rating for each, ranging from 0 - 3 stars. You also receive an overall grade; the highest being A+ and the lowest being E, which allows you to see how you compare the thousands that have already completed Damien's Money MOT. If you would like to see a full breakdown of your scores, you can sign up to receive Damien's Action Plan, in which you can opt to receive either daily or weekly emails that are tailored to you (in order of priority) to help you improve your score, however this is not obligatory. Damien's Money MOT is the only financial health checker tool where I scored well for my financial wellbeing which is the result of the tool's ability to recognise and understand my own personal situation, such as not actually needing a will right now. As a result, I scored a B+ in comparison to 2/5 stars for the Standard Life financial health checker tool and a red sad face for The Money Advice Service financial health checker tool. 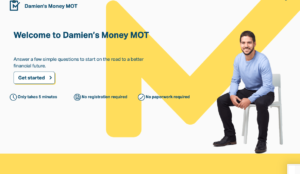 Damien's Money MOT is a financial health checker tool that is totally free, tailored to each individual and offers an action plan that actually helps you to move forward and improve your financial situation. The idea of the tailored plan is to praise you for the good work that you have already accomplished and then hold your hand as you accomplish each additional step, improving your score along the way. Damien's Money MOT is the most accurate out of the financial health checker tools that I've tried and more importantly, it is the one that offers the best solution, tailored in a way that tackles the important issues first and in a way that I feel I can easily manage and keep on top of. When to use a financial adviser?